Team leader, Florent Payet, current European Champion, will ride a newly built 29’’ Mondraker Summum. Baptiste Pierron who was ranked 15th by the end of the 2017 world cup overall show that Amaury wasn’t the only Pierron that was one fire! Marine Cabirou, 2015 Junior World Champion and 2016 Elite European Champion is committed to staying at the top of women's rankings and after a nice podium in Vallnord last year, she is working hard to be a regular at the top of the podium. Kevin Marry and Antoine Pierron (the third member of the Pierrons) were in the top league juniors, they both have a really strong potential and should perform very well in Elite. We will also continue with Thomas Denizot on the 4X Pro Tour and help a few national riders as well as new, yet unseen, young riders, stay tuned. We want to thank all of our fellow partners, it is pretty difficult nowadays to maintain partnership over time. We've spent eight years with Mondraker (Frames), it's our fifth season with SR Suntour Formula have sponsored us for ten years and Kenny Racing has been onboard for seven years. In addition, Mavic will provide the wheels for a fourth year, RaceFace will provide the drive train, Reverse Components bars and stems, Shovel chain guides, Crankbrothers will manage the pedals, ODI for the grips and we will still have custom SDG saddles and seat posts. Last, our long-term supporters Pedros (Tools, Lub & Clean), Novyparts (Chassis setup), Cyrpeo Bike Shop and Julien our friend from TchoukTV remain as sponsors. Finally, we are happy to announce a new partnership with Schwalbe (Tires) and HXR Components (Custom Parts). 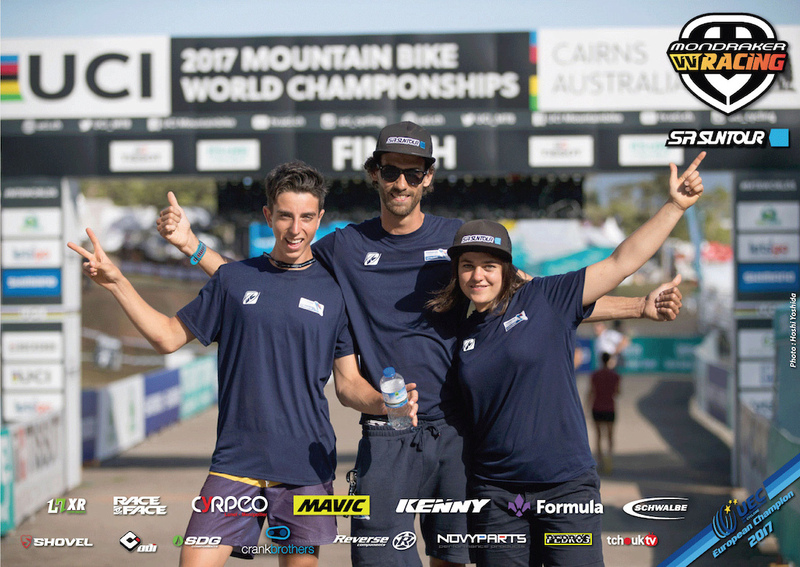 i am more than a bit surprised that Marine Cabirou did not make the swith to the Mondraker Factory Racing team this year, being a welcome female presence on the team that has been absent since Ragot retired. Good on voulvoul to continue their support of her after her very good 2017 season though! Sounds like Payet is finally getting them to build him a bike that fits him properly. I'll miss the dh bmx action but it'll be interesting to see the formula 29er fork in action as he will probably be the only higher profile rider with one on the circuit. Is it 'resigns' or 're-signs'?